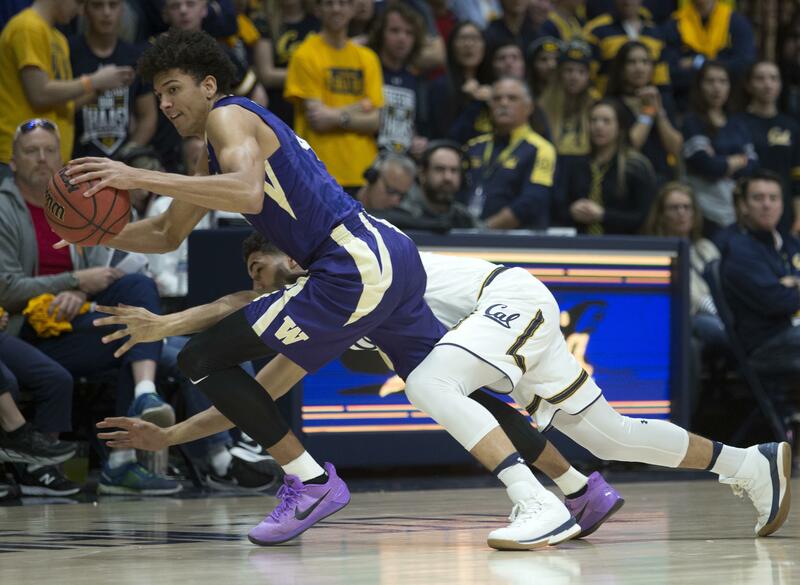 UPDATED: Sat., Feb. 24, 2018, 5:12 p.m.
BERKELEY, Calif. – After a disappointing loss at Stanford two days earlier, Washington was looking for some energy against California on Saturday. The Huskies got it from freshman Naz Carter, whose spectacular tomahawk dunk sparked a decisive 16-2 run in the second half and inspired his teammates in a 68-51 Pac-12 Conference victory over the last-place Bears. Teammate Jaylen Nowell, who led the Huskies (19-10, 9-7) with 23 points, watches his 6-foot-6 teammate every day in practice. But even he could hardly digest what he saw when Carter took off eight feet from the basket and soared over Cal defender Cole Welle. Cal (8-21, 2-14) led 43-39 when two free throws by Noah Dickerson triggered the decisive six-minute run. Dickerson had eight points in the burst, including a spinning drive through the lane that made it 55-45 with 10:20 left. Carter’s dunk came early in the rally, during which the Huskies ratcheted up their defense. Cal made just two of its final 18 shots and was 0 for 8 on 3-pointers in the second half. Cal coach Wyking Jones said that once big men Kingsley Okoroh and Marcus Lee each picked up his fourth foul, the Huskies were able to focus their defense on the Bears’ perimeter players. Darius McNeill, who scored 17 first-half points, was scoreless in the second half. Dickerson contributed 16 points and nine rebounds for Washington. Cal’s only other double-figure scorer was Justice Sueing, with 12 points. Washington junior David Crisp scored only six points, but finished the day with 1,003 for his career, making him the 40th Husky to reach the milestone. Published: Feb. 24, 2018, 4:09 p.m. Updated: Feb. 24, 2018, 5:12 p.m.